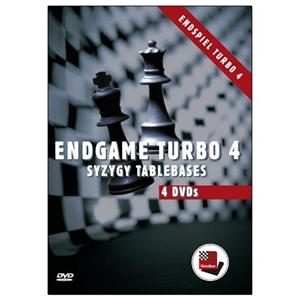 The Endgame Turbo 4 consists of 4 DVDs with endgame databases (Syzygy Tablebases). With the help of the Endgame Turbo, all five- and 27 six-piece endgames (including the sophisticated and practice-oriented endgame (R,P,P vs. R) are played with absolute perfection. Likewise, top chess engines like Komodo Chess 8 and Houdini 4 handle endgames with more than six pieces much better since the programs can already access the endgame knowledge during the analysis. Definitely a must-have for correspondence players, endgame theoreticians and friends of engine matches! The Endgame Turbo 4 contains all endgames with three pieces up to five pieces. Plus 27 of the most important endgames with 6 pieces. 20 GB free hard disk space.